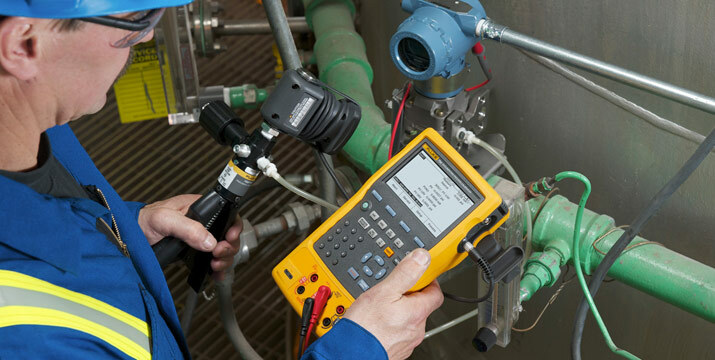 The Fluke 754 Multifunction Documenting Calibrator automates calibration procedures and has HART capabilities. With the fluctuating price of raw materials, industries are faced with a challenge to adjust to the times and the profit margins. One of the few ways to control costs in all of industry, in fact, is to get leaner and more efficient. And one of the best way to control those costs is taking a look at where the waste is in your process. That means a lot of fine tuning to make sure, from an instrumentation standpoint, that you’re getting the temperatures and pressures right for high quality production and the efficient use of input. Calibrating equipment improves optimization and quality – and that holds true in other process industries as well, whether it is chemical processing, nuclear power, pharmaceutical or pulp and paper. Process manufacturing plants require hundreds, even thousands of sophisticated devices that perform countless critical operations ceaselessly, accurately, and reliably. Those devices in turn require regular inspection, testing, calibration, and repair. Centuries of industrial experience has established the value of carefully recording the details of those inspections, tests, calibrations, and repairs. More than a best practice, businesses and governments often require highly specific record keeping to assure that full value is delivered to customers and that the health and safety of citizens is protected. However, traditional testing, calibration and documentation practices are also labor-intensive, and with senior operators in scarce supply, down-sized teams sometimes choose to defer regular calibration. The latest industry findings suggests that smaller teams can feasibly conduct and document device calibrations, at a lower overall cost, with additional productivity and operational reliability benefits. Calibration is typically performed either where the device is located (called in situ calibration, from the Latin for "in position") or in an instrument shop.